So you have a list of people you need to get Christmas gifts for, but haven’t purchased anything yet? We decided to compile a list of home textiles available from LinenMe that are perfect gifts for your loved ones. There’s still plenty of time left to order from LinenMe, but don’t leave it until the last minute! We are on good terms with Santa, but he is not very good with ‘last minute deliveries’! 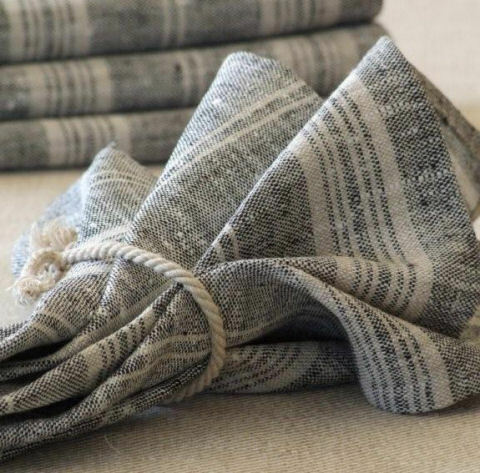 These lovely linen napkins from the newest LinenMe Multistripe collection are a wonderful addition to any dining occasion. You can either get a pair, a set of four or six. Absolutely lovely if combined with other multistripe items, but just as gorgeous on their own! An excellent bathroom, shower or spa accessory, this natural linen terry glove makes massages your body and improves the blood flow. Great value for money, and made of natural materials, the glove will be a thoughtful present to anyone who loves taking their time in the bath! This natural linen pot handle holder in subtle stripes will make cooking a much more enjoyable experience! This is a great Christmas gift for the aspiring chefs in your family and among your friends. 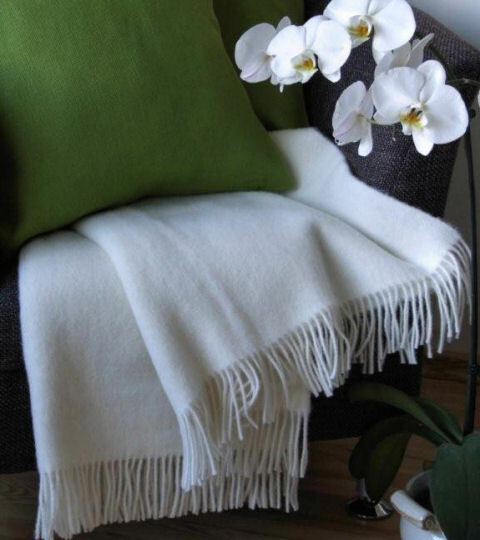 A stunning green cushion, made from the finest 100% linen fabric, will bring spring and colour to the room. An ideal gift for those who are looking to sprucing up their homes, or perhaps friends who love this colour and adore any items that come in rainforest green? There are other colours available from LinenMe Emilia collection, so take your pick! Our huckaback towels have become a sensation since the day we introduced them. This bath towel has very Christmassy red stripes across it and is a cheerful addition to any bathroom, not to mention the excellent job it does absorbing the moisture and massaging your back! Two extremely cute linen tea towels in navy and red will spruce up any kitchen! A colourful and thoughtful gift for those who can spend hours, or days, in their kitchen, getting creative and – let’s admit it – messy. The towels are highly absorbent and will clean any mess within moments. Luxurious table linens always make great gifts, whether it’s Christmas, Easter or Birthday. This stunning design is from our newest Rhomb collection and will make someone very happy! This rich burgundy red table placemat is simply stunning, and perfect for both your Christmas table, or as a Christmas gift. 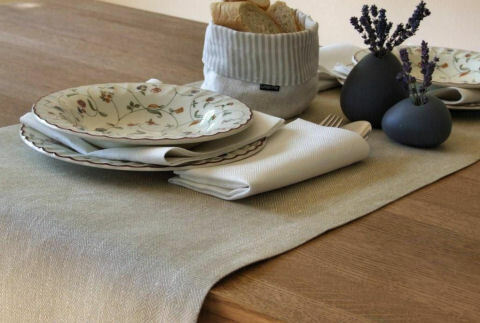 Very hard-wearing, the placemat has lots of texture and will feel so much softer after a few times it is washed. Another Christmassy item from the wide range of LinenMe table linens, this Provence table runner has gorgeous red stripes across it and is difficult to resist. Made from 100% highest quality linen, it will get the luxurious soft feel with time. Irresistible! This black 100% linen scarf from Twist collection really has a twist – it feels softer the more you wear it. A stunning and trendy clothing accessory, perfect for summer, but doesn’t mind if you wear it in winter or spring! A perfect gift for her or him. It’s Christmas, so red colour is highly in demand! 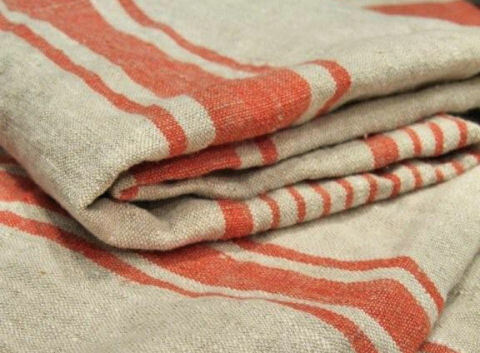 Nevertheless, this striking red stripe linen tablecloth is suitable for any time of year, any season and any occasion. A very smart gift for someone who loves natural fibres and unique home textiles. An absolute classic, this pure linen tablecloth in a slightly off-white colour makes a fantastic gift for your mother, a sister or a daughter-in-law. It feels and looks luxurious and elegant, and will be showered with compliments whenever in use! Who can say no to beautiful colours, especially when they come in great combinations? A perfect gift for a style-conscious friend or a family member. Luxurious, soft and warm – what else can someone expect from a Christmas gift? This elegant ivory merino wool throw will cheer up anyone who loves snuggling up, or who can’t stand the cold! Luxury comes in many forms and shapes, and this one comes beautifully hemstitched in off-white shade. A perfect gift to anyone who refuses to sleep in anything else than the best quality linen sheets. We will be very happy to package your Christmas gifts for you, using lovely black boxes and green ribbon. This service is currently available absolutely free. There is also a superfast Christmas delivery option for those ordering goods for over £30; the purchased items get delivered within 2-3 days. 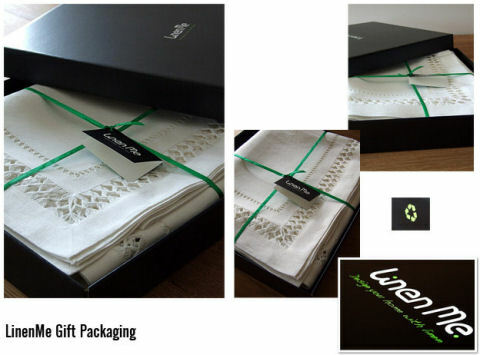 Make it easy this year – buy your gifts from LinenMe for as many people as you can and save time, effort and money. Merry Christmas! I love fish in a bag, that is the best kind of pet My garndma would love the art of the month, great idea! © LinenMe 2019. All rights reserved.